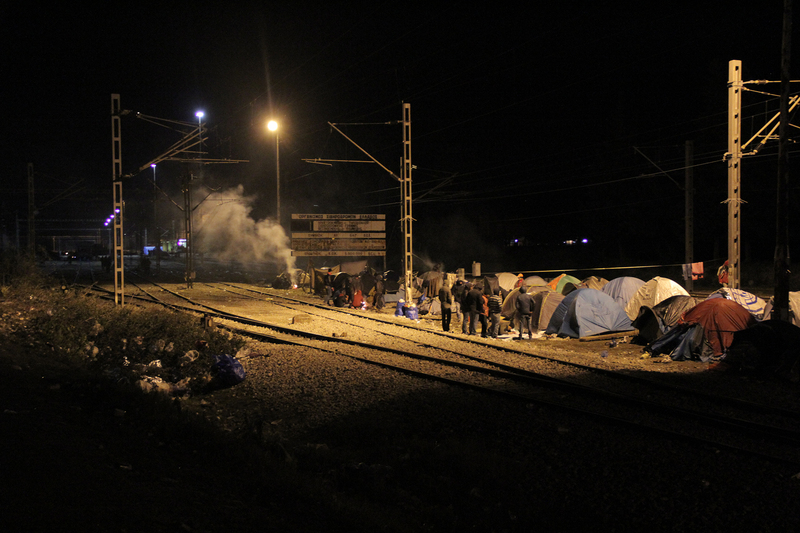 22.00: Many buses have arrived today which lead to increasing jams at the Greek-Macedonian transit checkpoint. 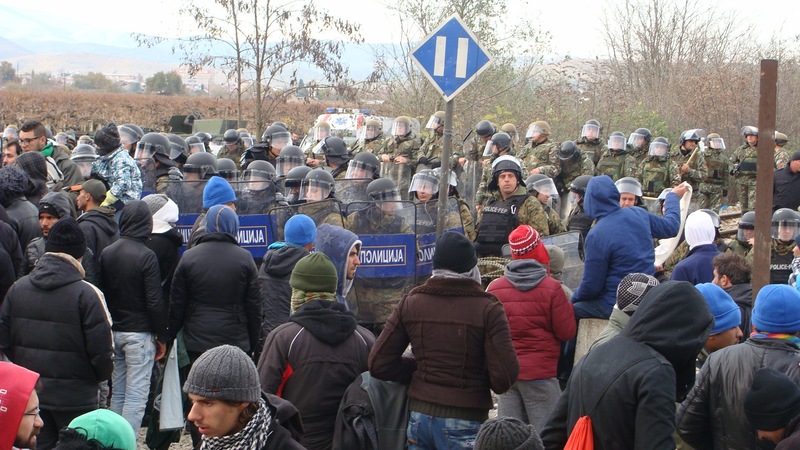 Some turbulent situations emerged, also because Macedonian army/police is not able to read Greek or Arabic papers and denominations of nationalities. 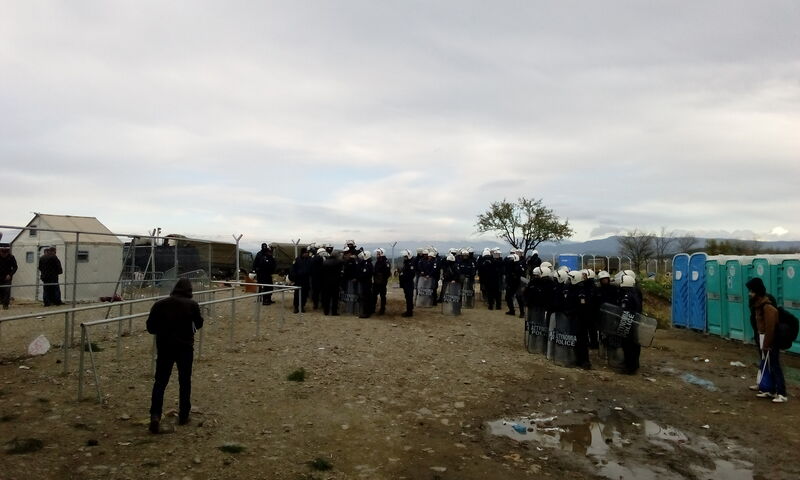 Tonight a heavily armoured Greek police unit is supporting regular police; it seems that Greek authorities perceive the camp more and more as a danger zone. 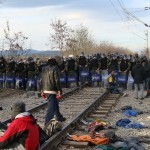 The policing of desperation and uproar is the current answer to this politically generated crisis. 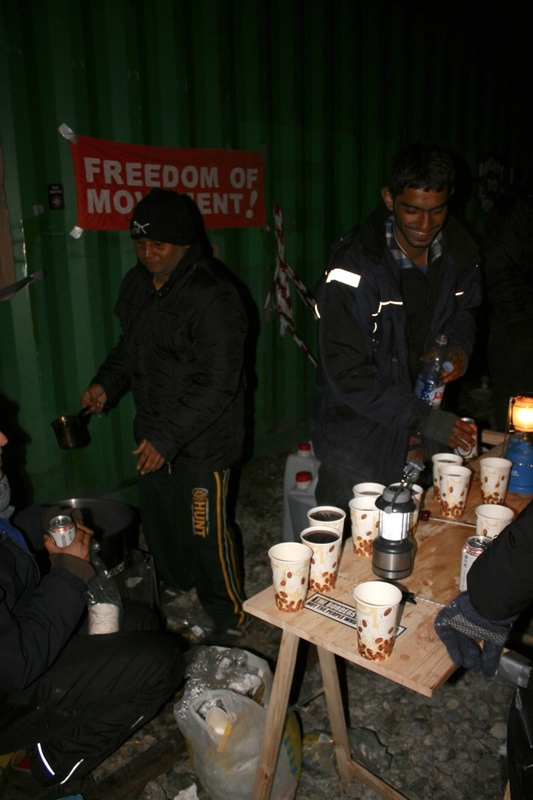 Quite the contrary indepent kitchens and infopoints are facilitating new moments of solidarities, self-organization and friendships. 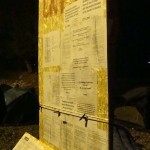 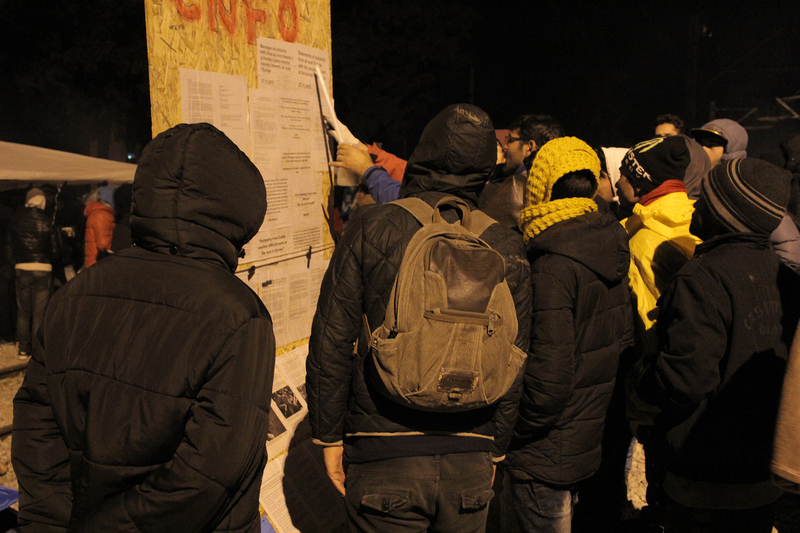 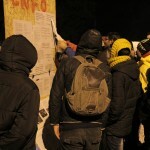 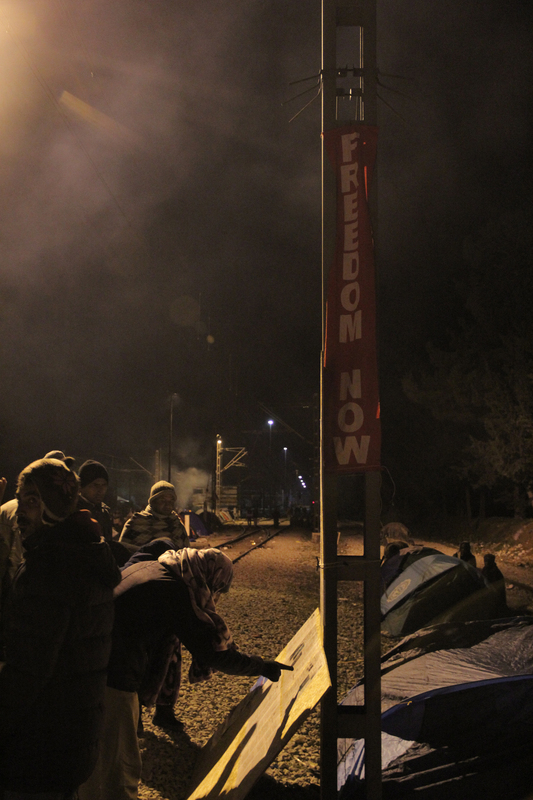 17.00: A spontaneous demonstration of around 150 people passed the camp and finally stopped at the fence to protest. 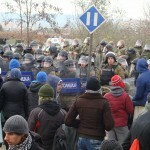 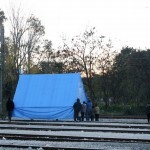 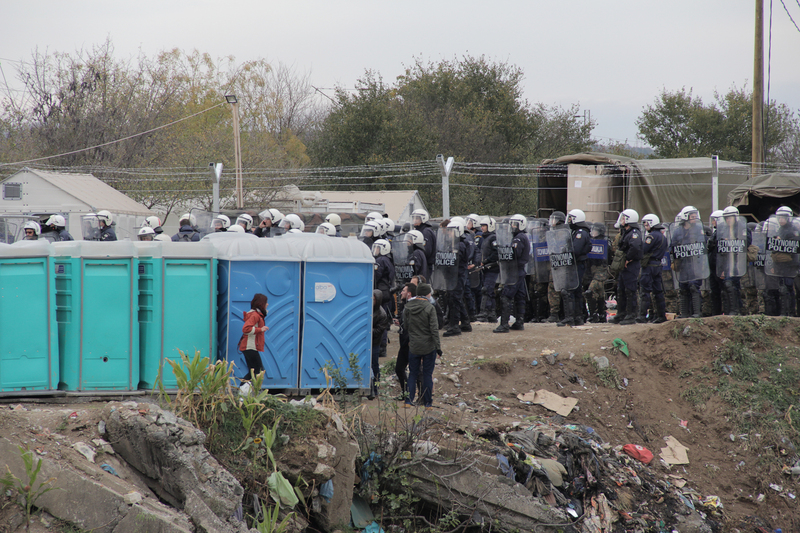 Macedonian police/army has installed water cannon behind its fence. 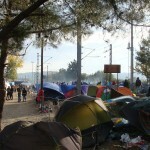 Still many people arrive at the camp. 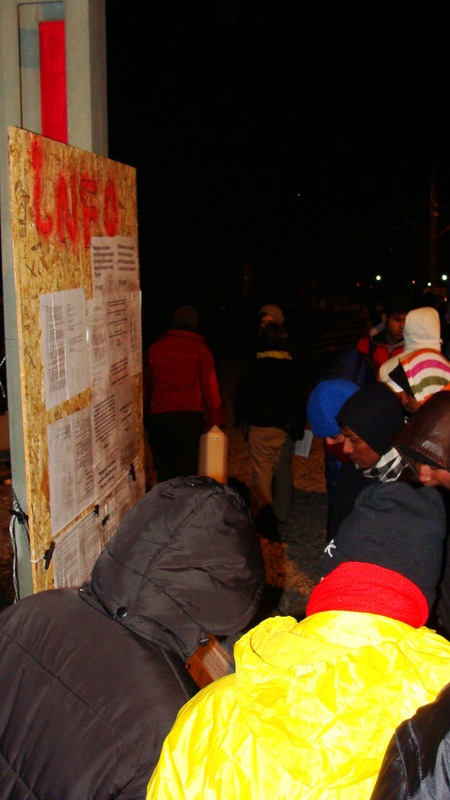 Long queues for food and water. 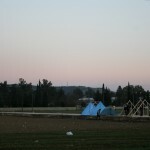 The night will be very cold. 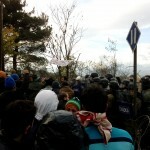 12.00: Several protests in front of the fence, shouting „Open the gate“. 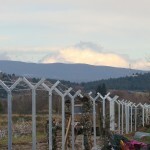 Last nigth first snow was dropping in the mountains near by. 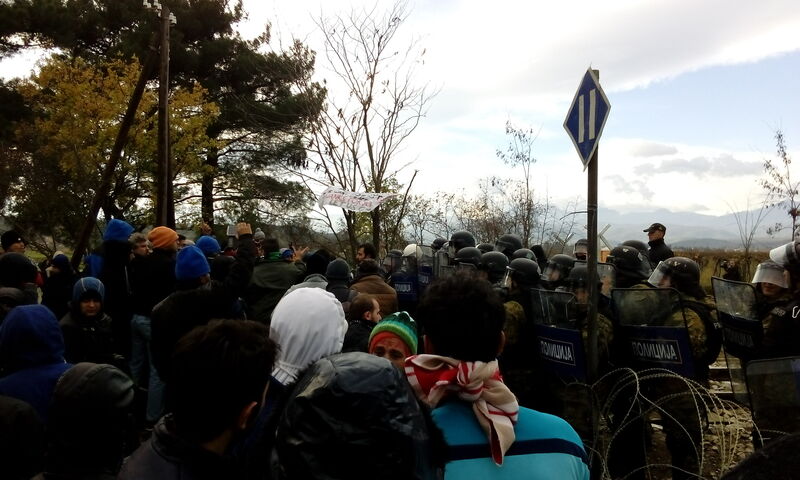 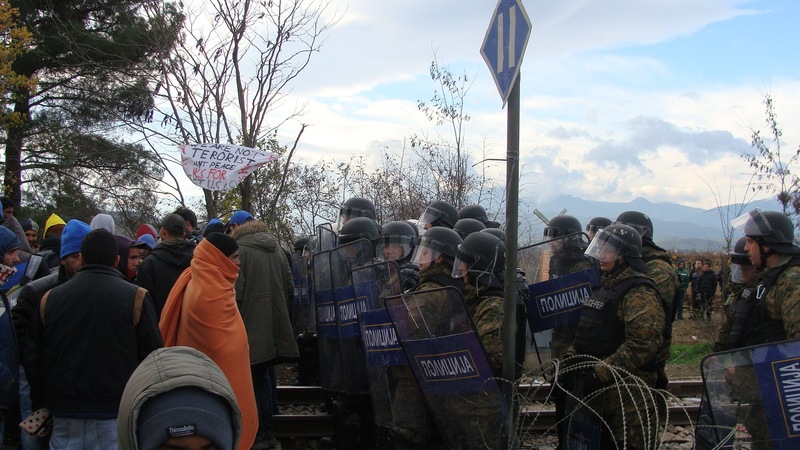 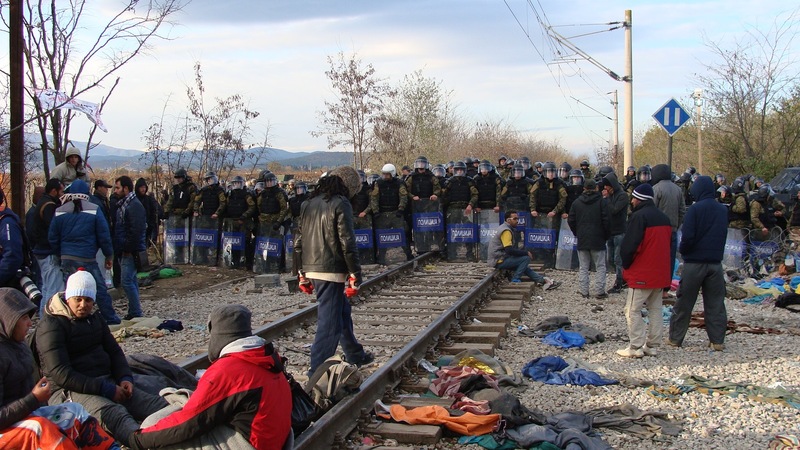 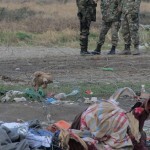 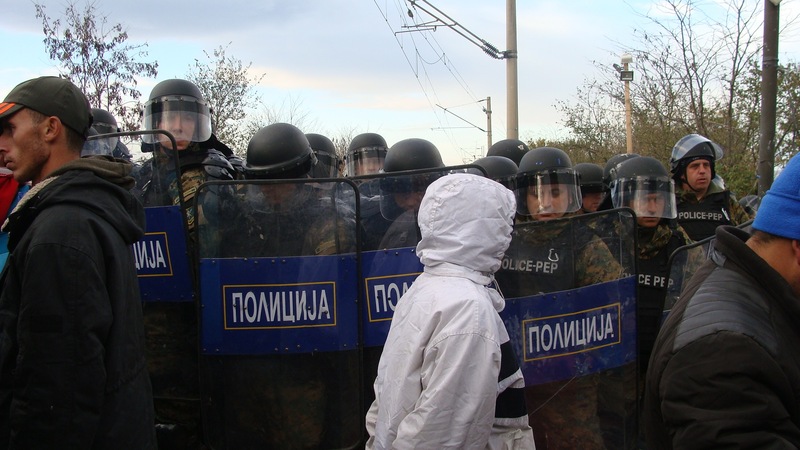 The situation in Idomeni is getting worse. 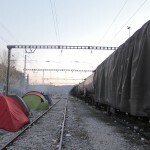 Many people are stuck at this spot for 10 days now. 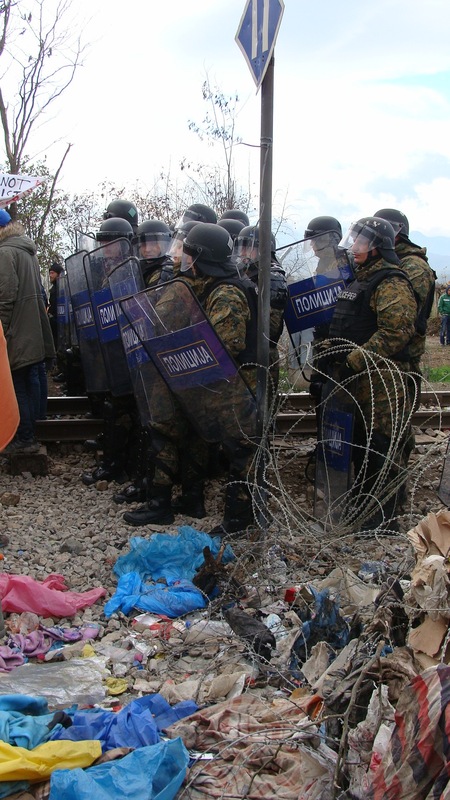 They are refused to enter Macedonia unless they are holding passports from Syria, Afghanistan or Iraq. 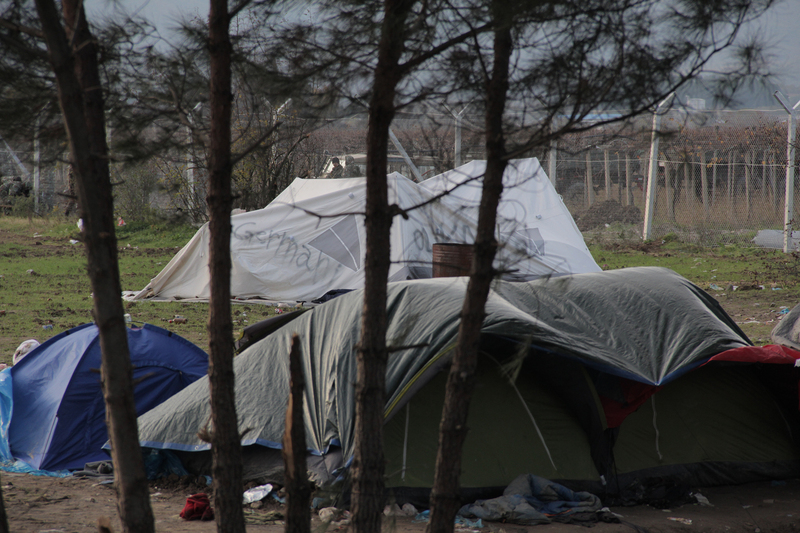 At night the temperature drops to around 5 degrees, the cold wind blows hard and many people only find shelter in self built tents. 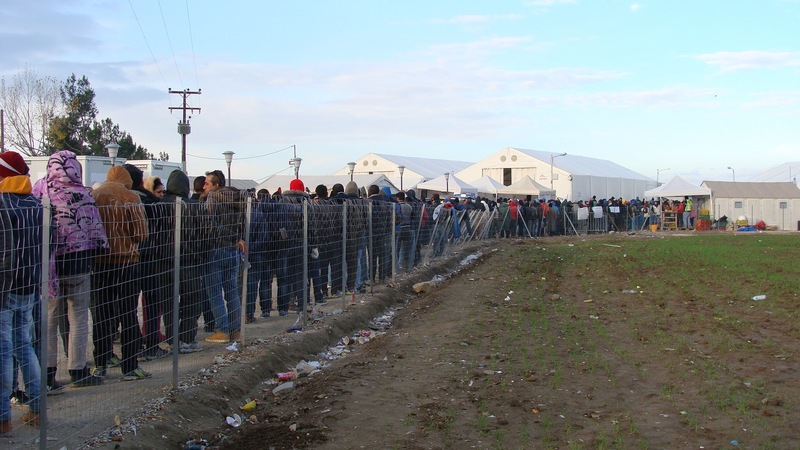 Apart from the big NGO Praksis there are now two independent kitchens that prepare food for over 1’000 people, but still people have to wait in long queues. 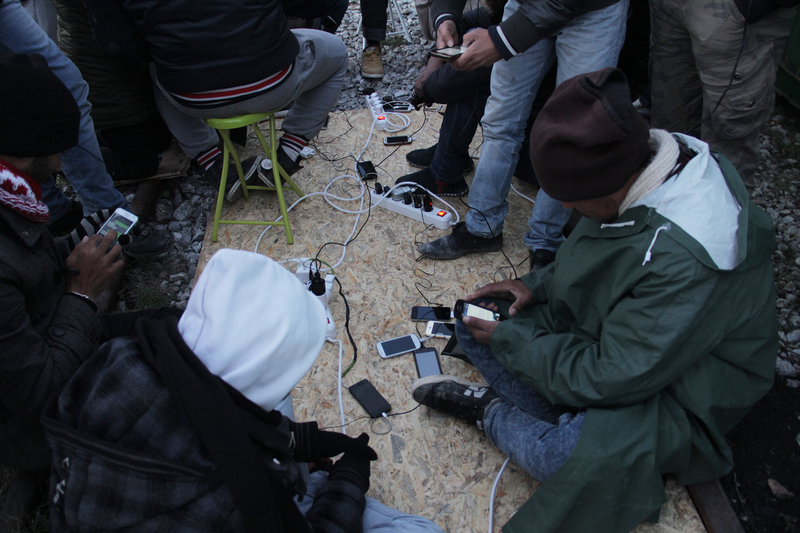 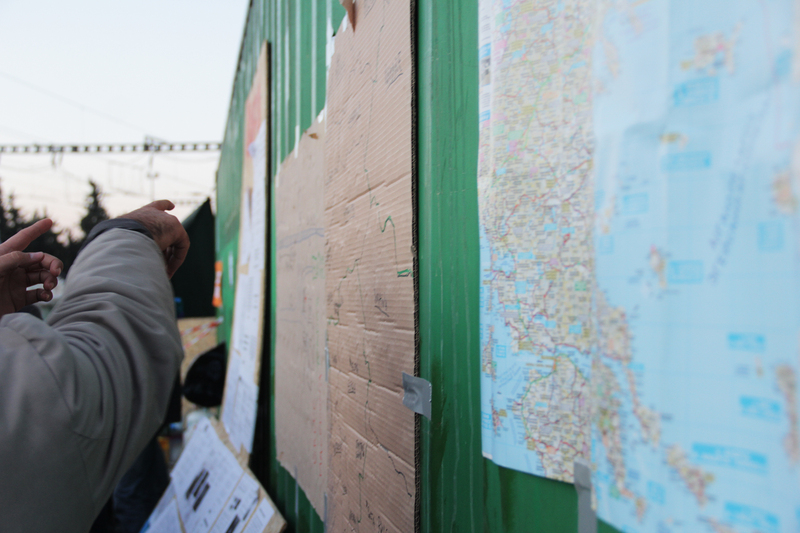 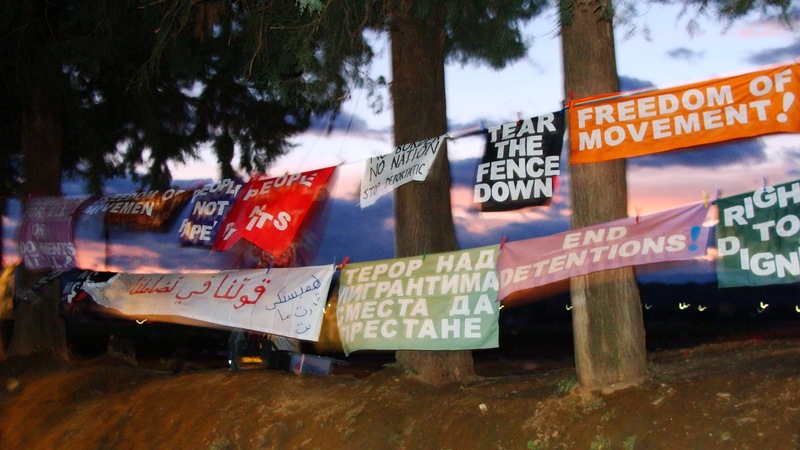 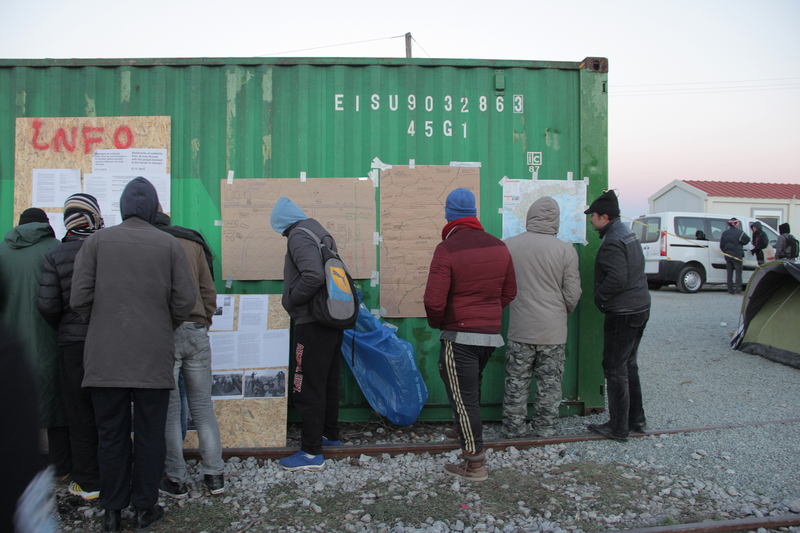 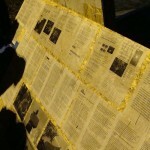 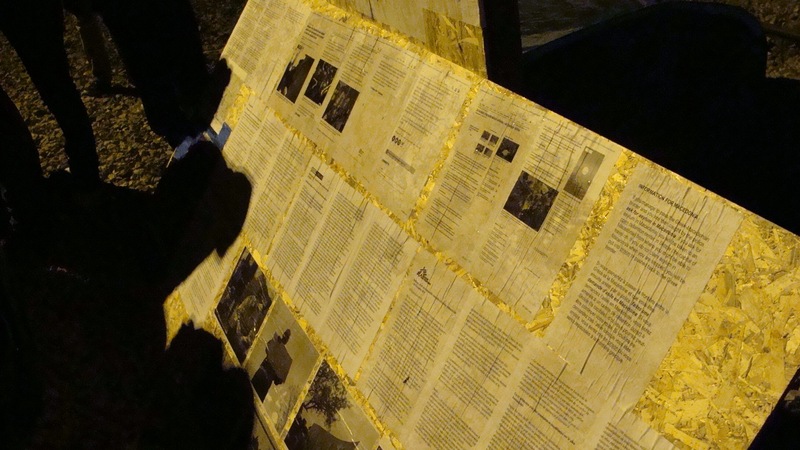 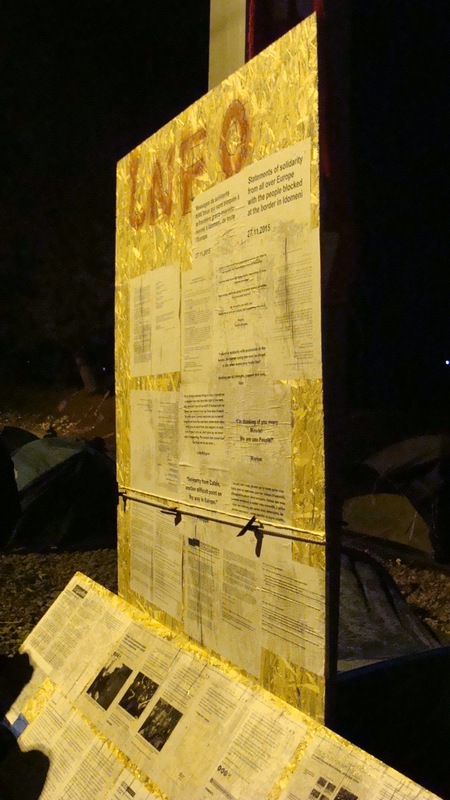 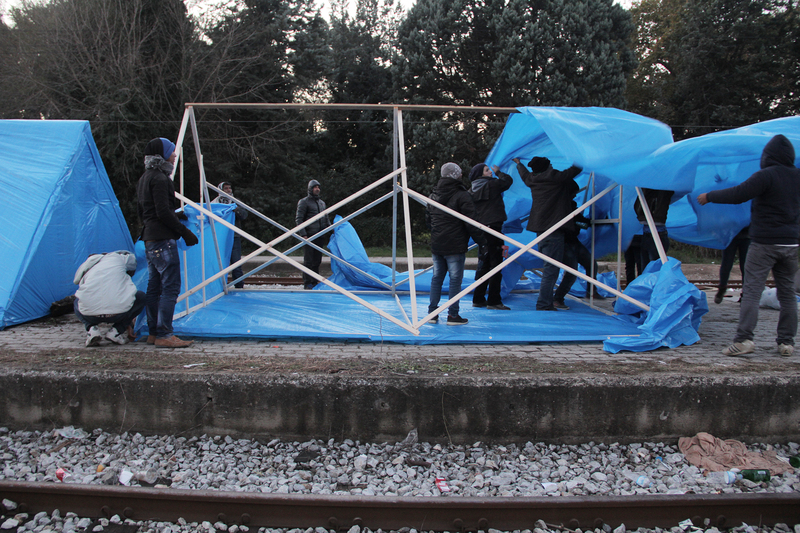 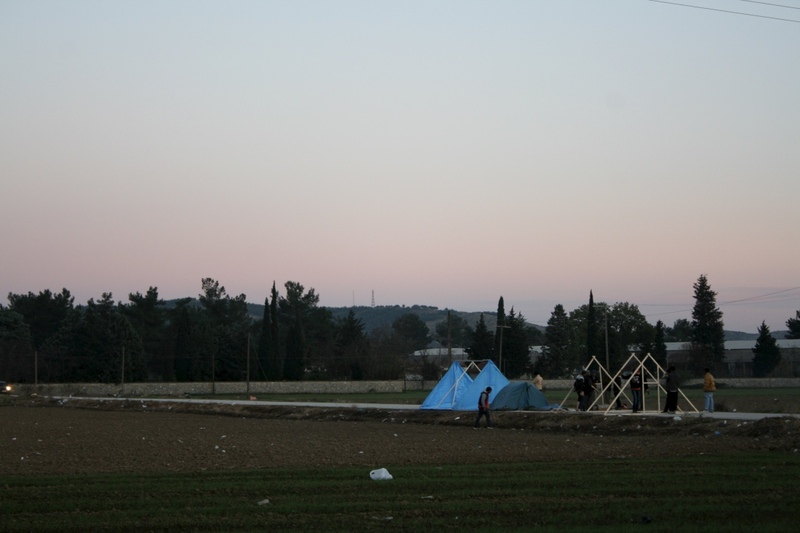 These independent groups create spaces of solidarity within the camp. 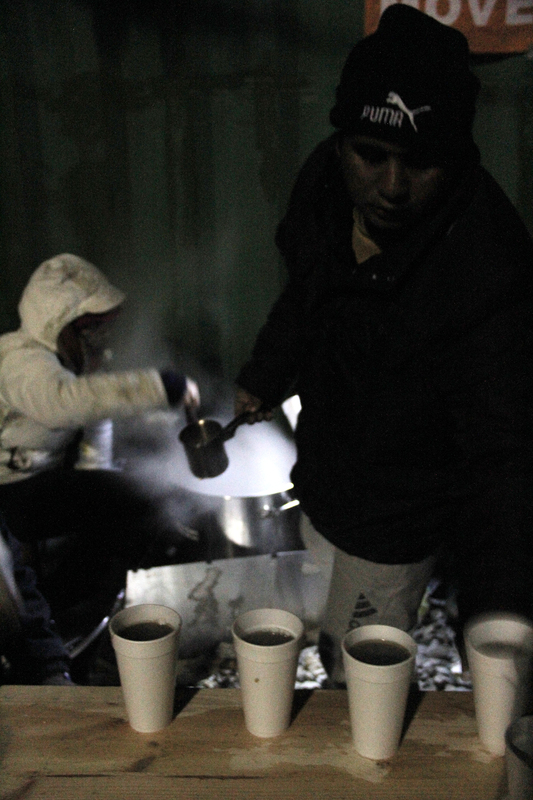 Refugees together with activists are preparing food and cooking hot tea. 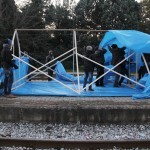 They fix electric generators, show how to built wind shelters and help where ever they can. 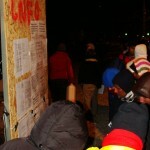 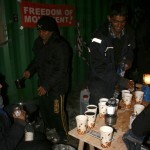 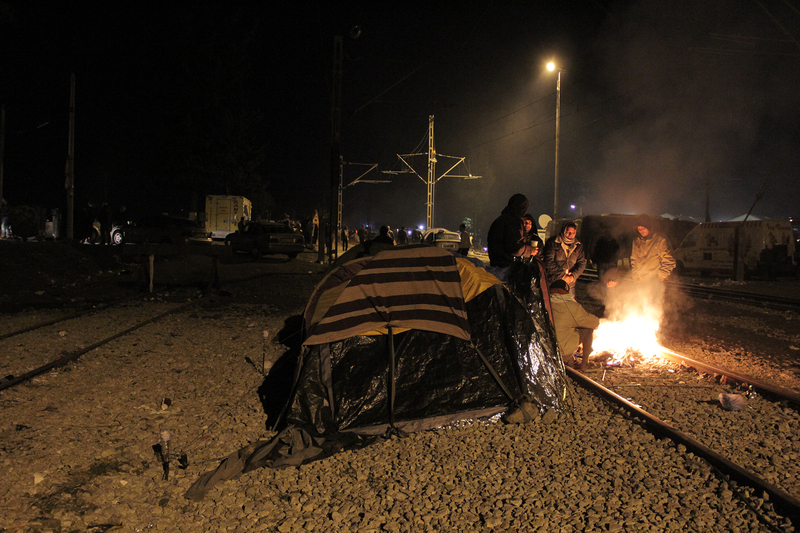 There is much knowledge in the camp but people mostly just have to wait and try not to get too cold. 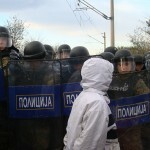 Of course there are also a lot of tense situations. 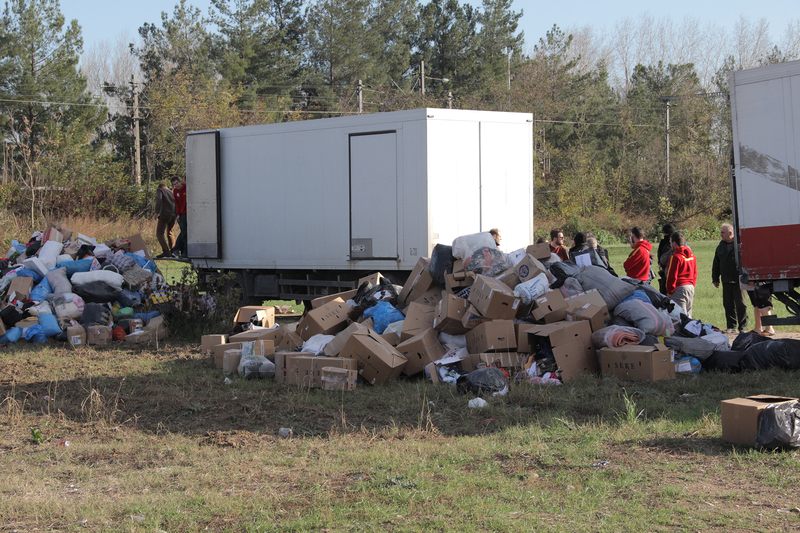 Volunteers that bring cloths and shoes in their cars are overran and so for women and children there is no chance of getting dry stuff. 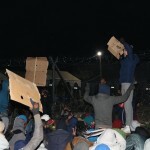 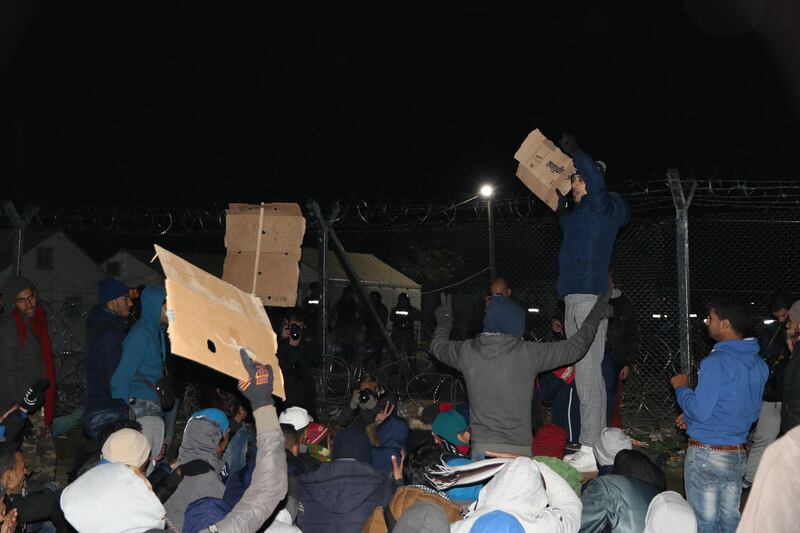 This obvious lack of dry cloths, tents and sleeping bags in the camp seems not to be a question of supply, but a political question as there are well stocked warehouses in vicinity. 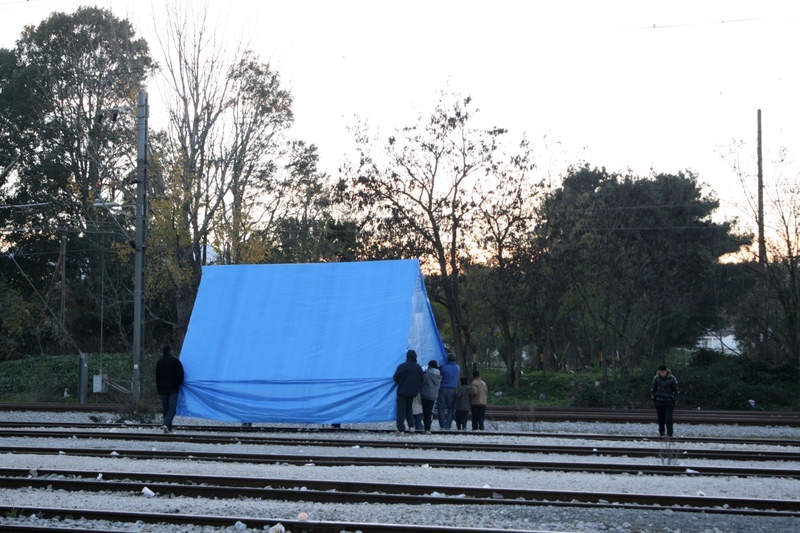 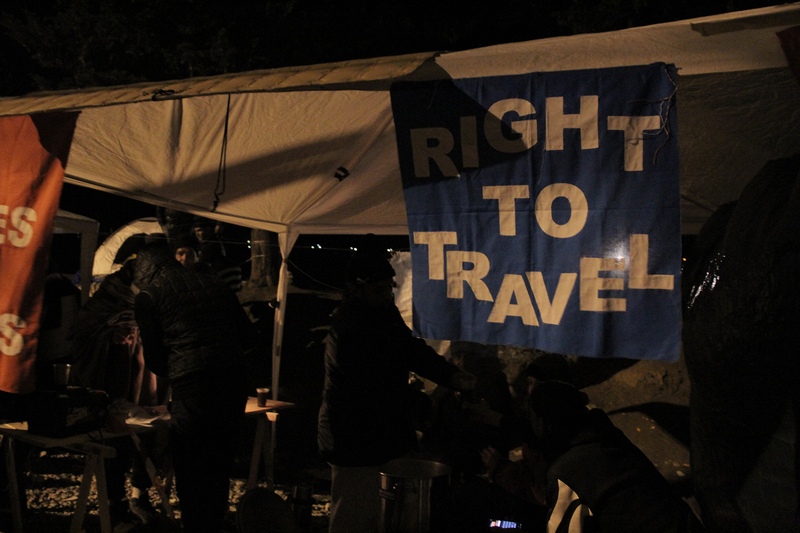 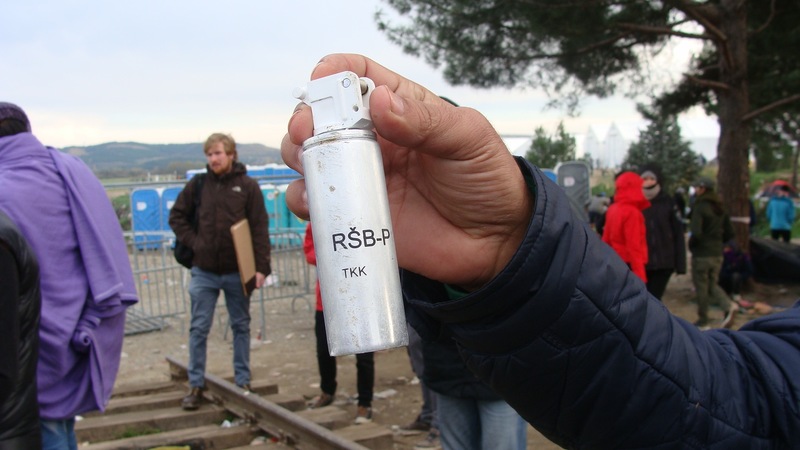 Either the UNHCR is not capable of organizing the distribution or they just want people to leave Idomeni. 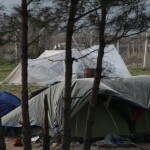 The general atmosphere in the camp is of course depressed. 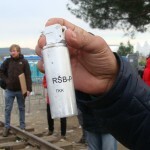 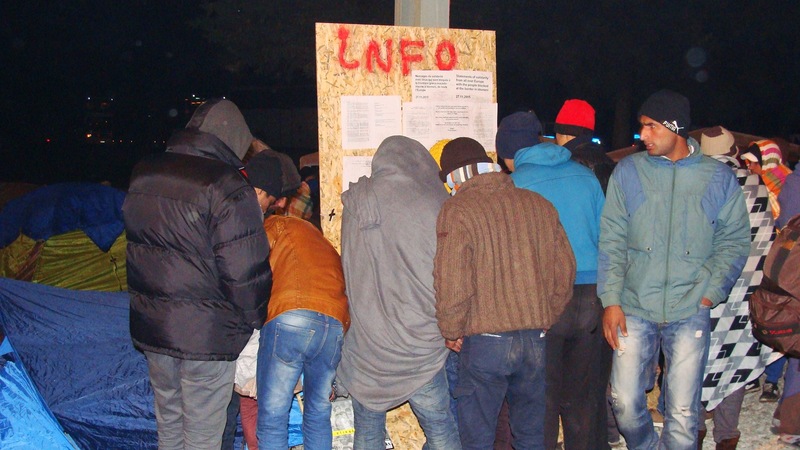 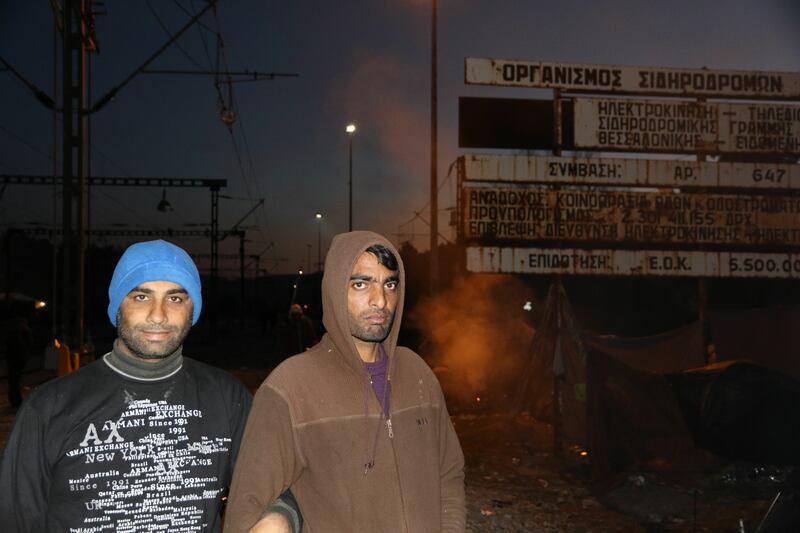 There is absolutely no information from Greek officials or the UNHCR about what people can expect. 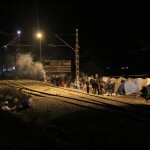 The question if the border will be opened is asked permanently and there are many rumors passed around. 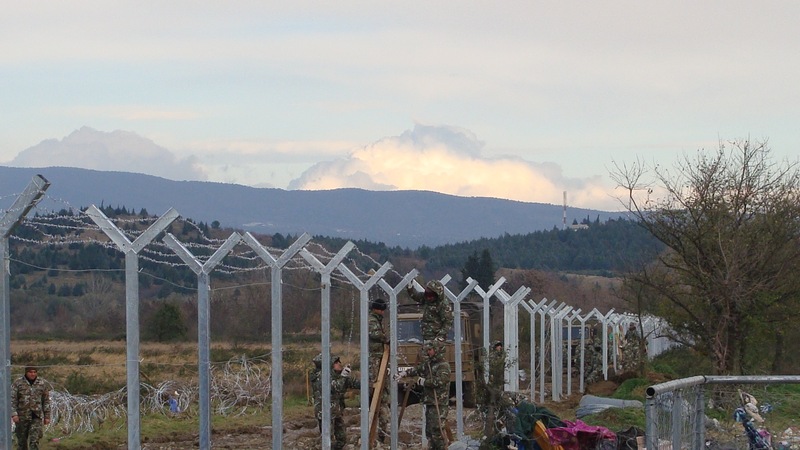 The new barbed wire fence long the border of Macedonia was completed on Sunday by the Macedonian army. 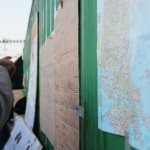 According to news reports it is at the moment around 3km long and planned to be expanded to 25 km. 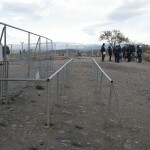 People that try to walk around the fence and they are found by the Macedonian army are directly deported back to Greece. 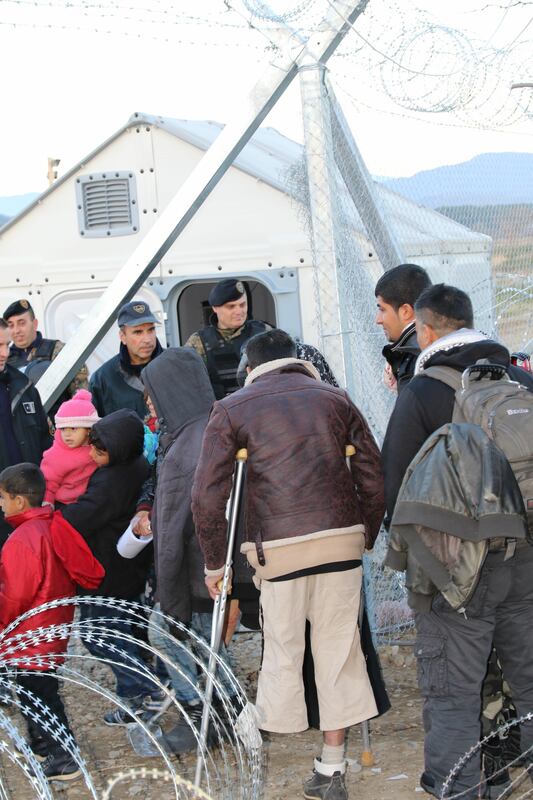 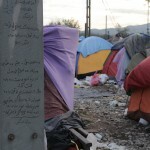 In closing the border for certain nationalities and deporting back to Greece Macedonia breaches the UN Refugee Convention that guarantees individual rights. 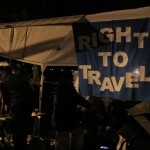 But so far no international outcry is heard. 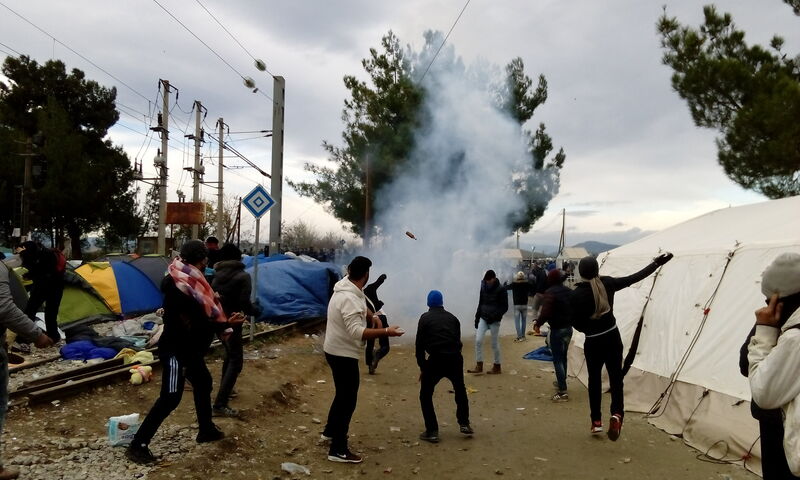 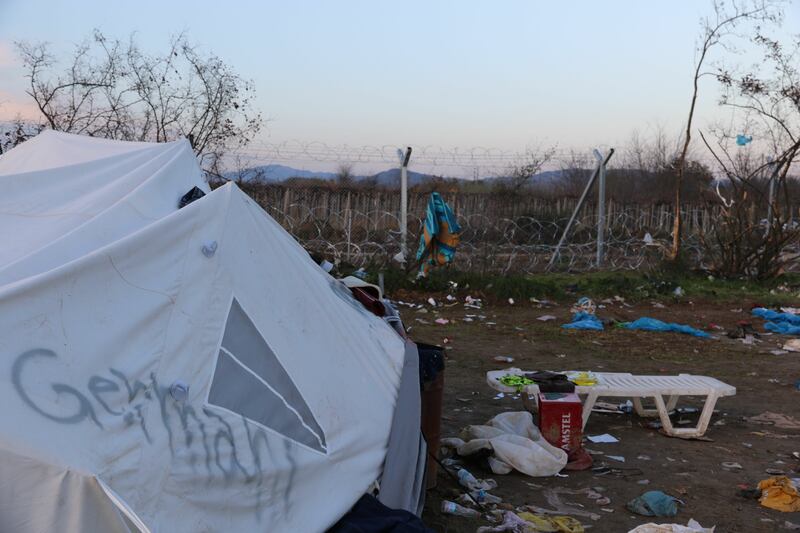 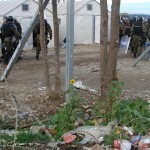 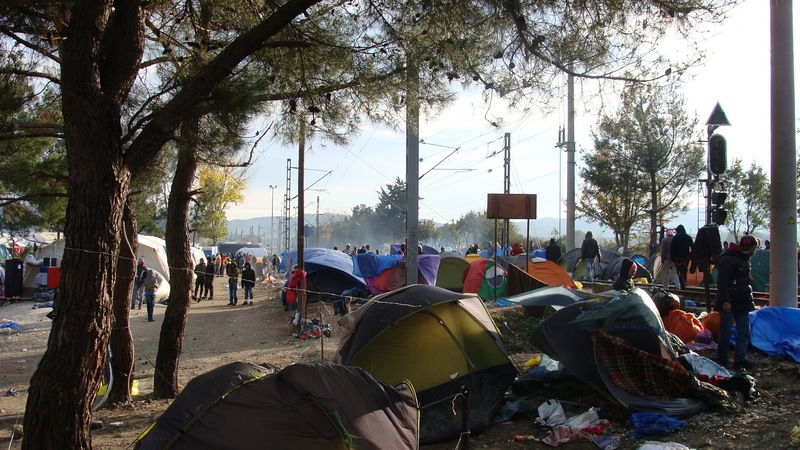 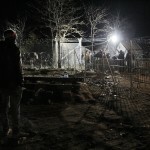 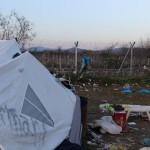 Rumors that Greece will built (detentions) camps in the province seems unlikely at the moment, as the provincial government rejected this plan. 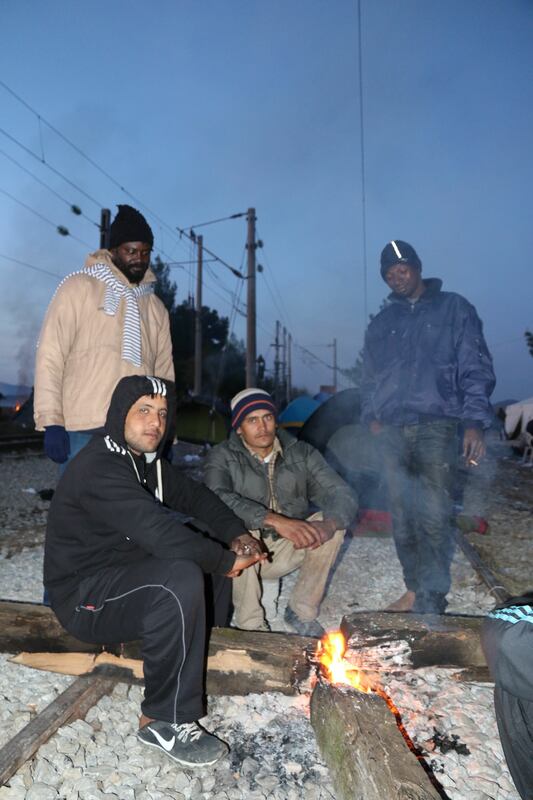 They do not want the refugees to stay in their province. 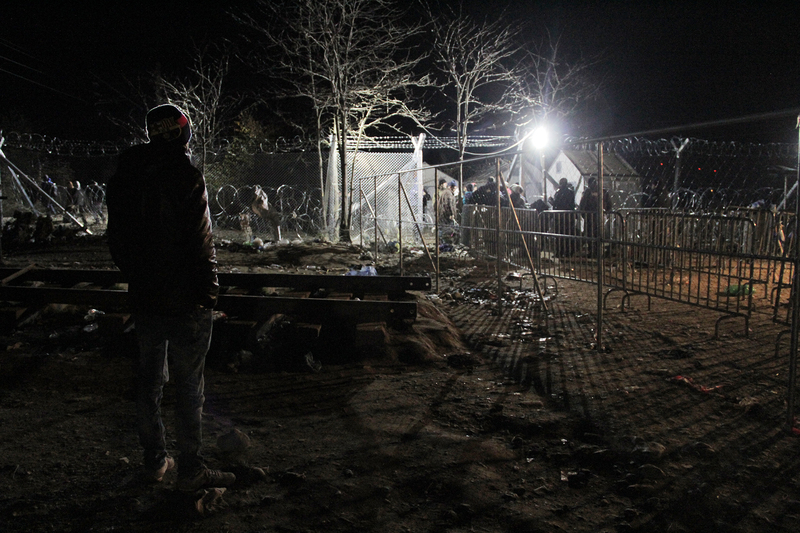 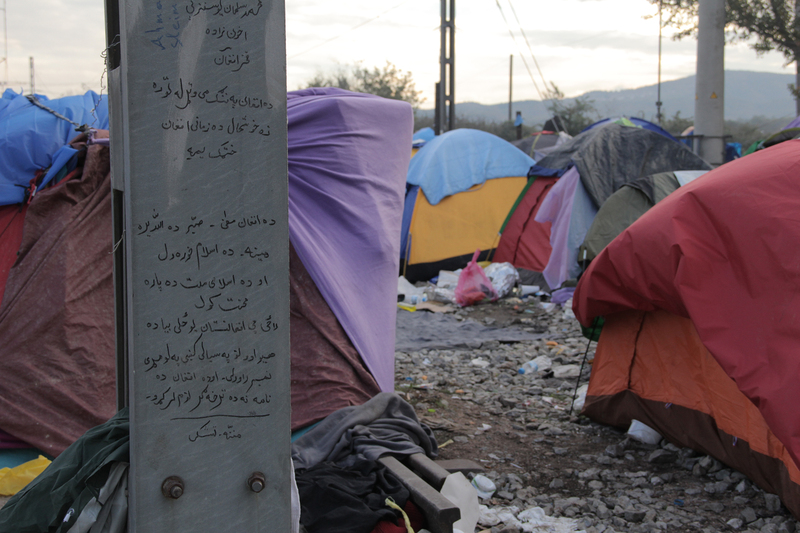 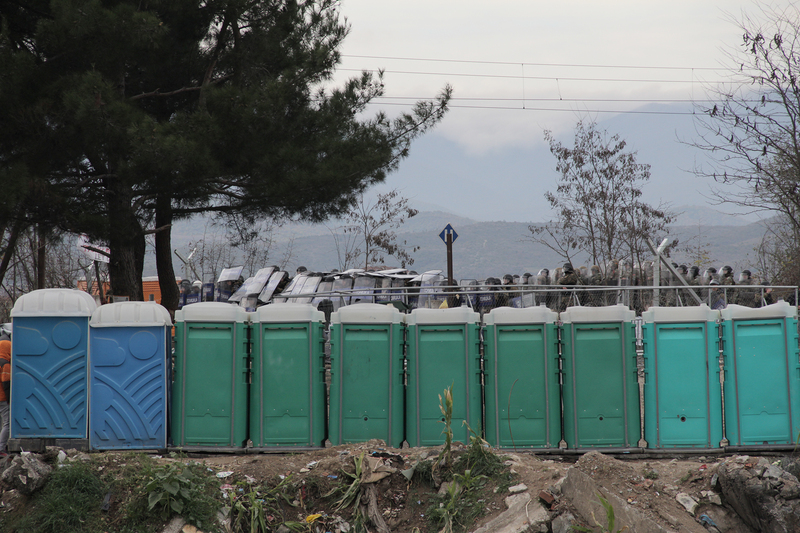 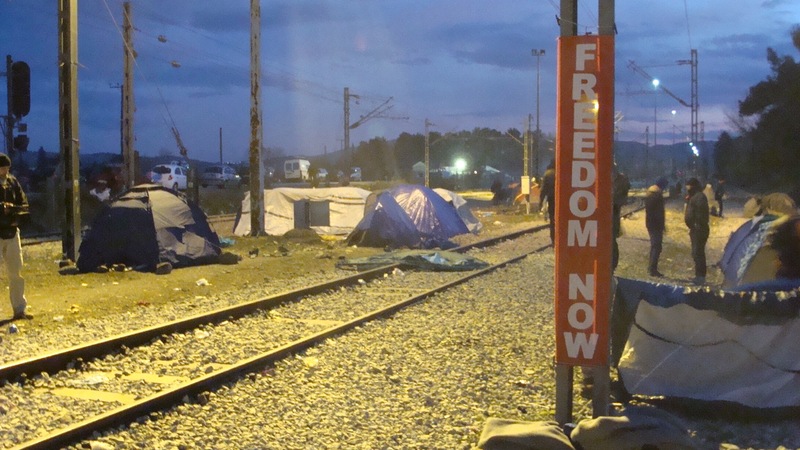 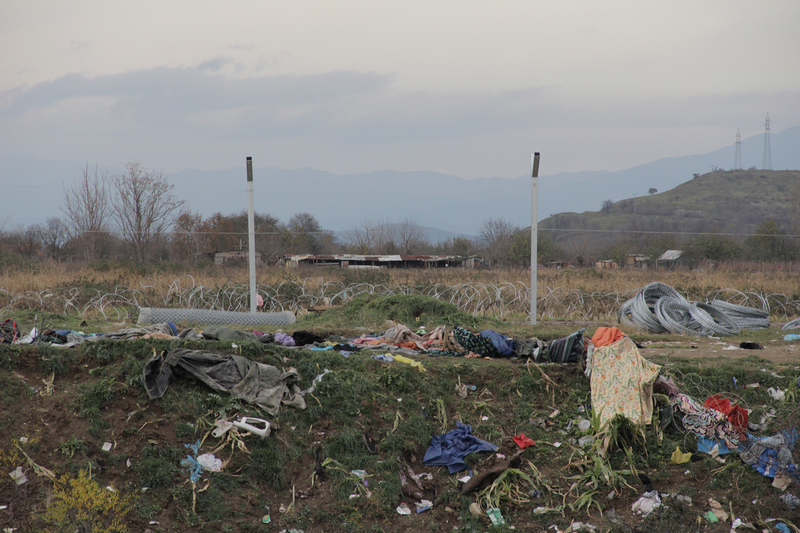 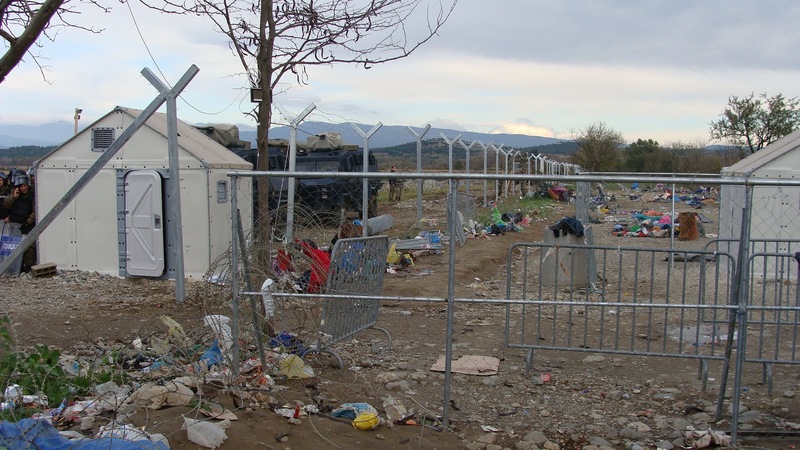 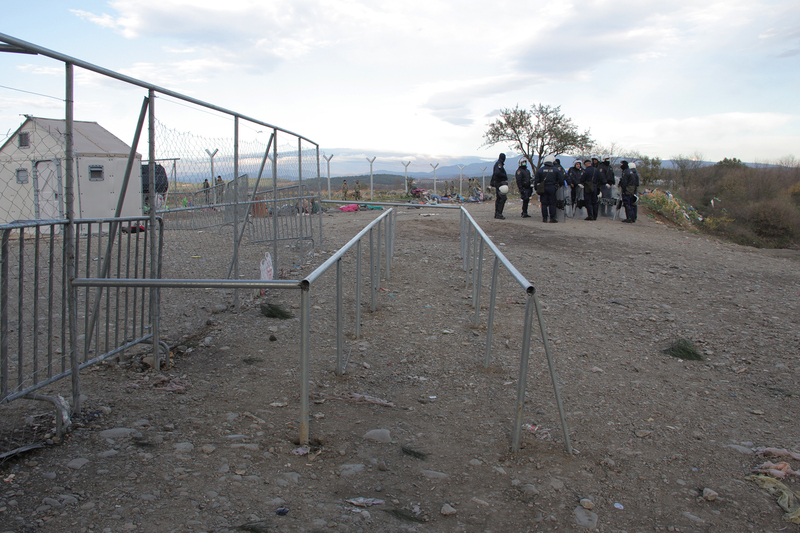 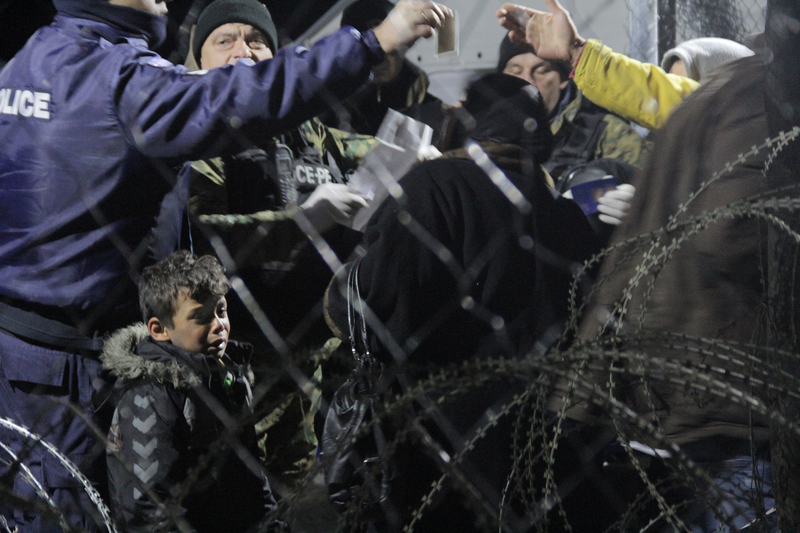 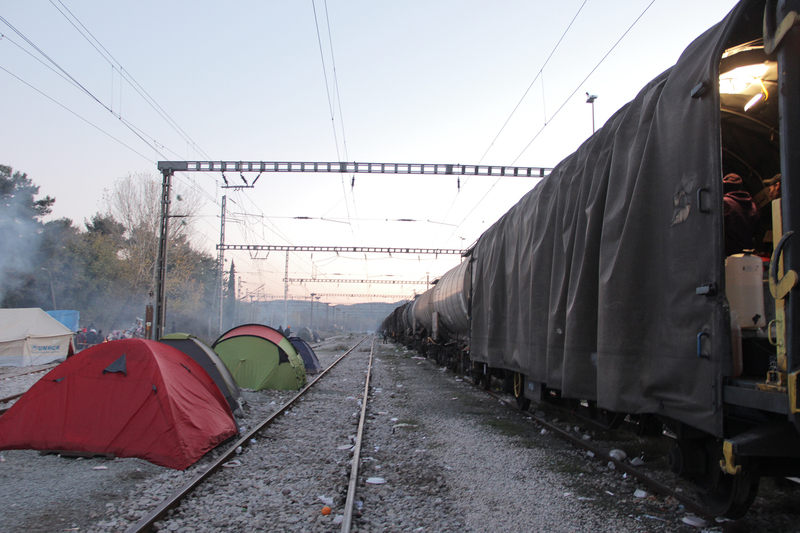 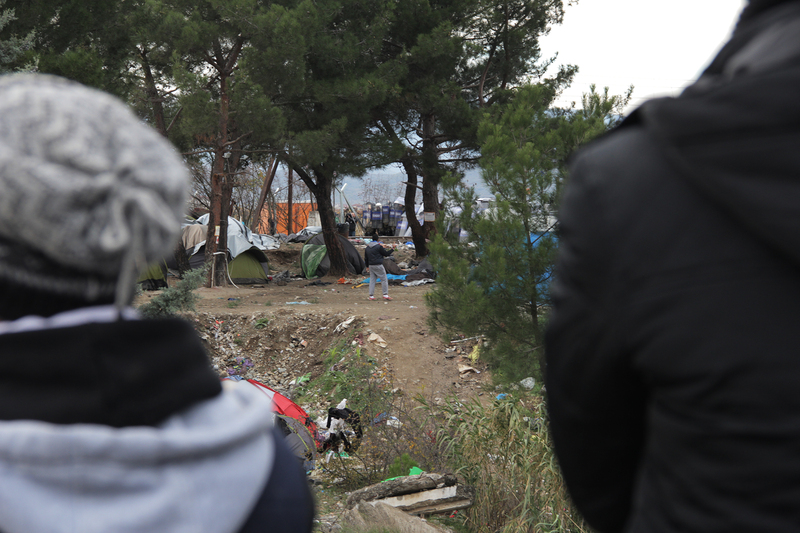 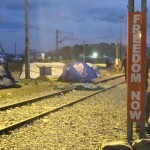 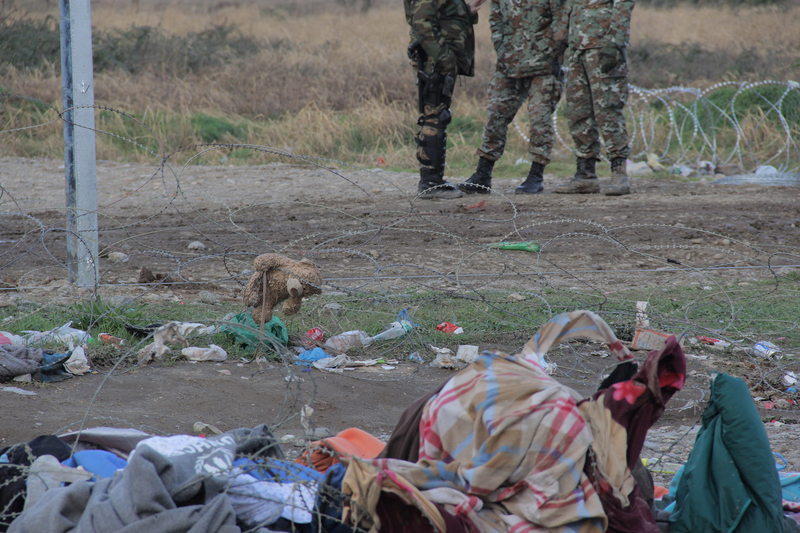 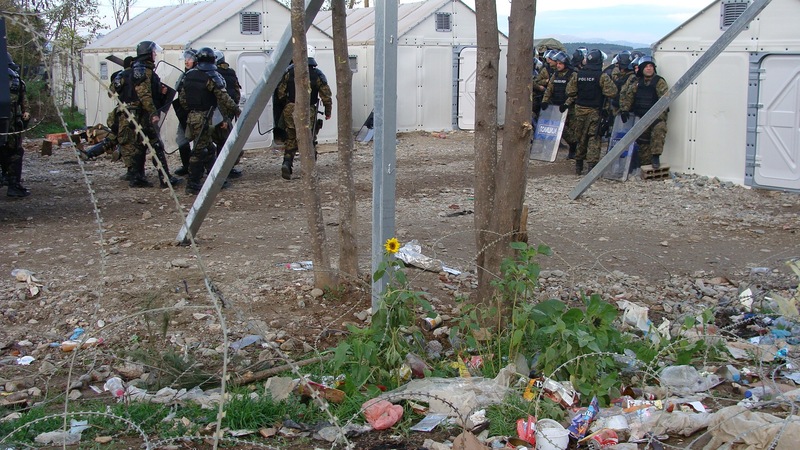 Photos from the struggels, the fence and the camp in Idomeni.